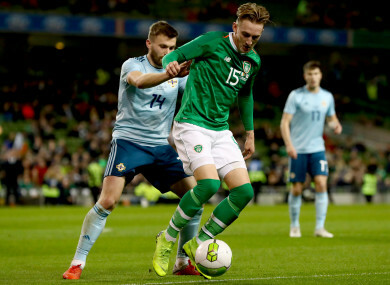 Ronan Curtis under pressure from Northern Ireland's Stuart Dallas during his Republic of Ireland debut. RONAN CURTIS HAD a hand in both goals as Portsmouth defeated Walsall to maintain their four-point lead over Sunderland at the top of League One. Pompey were 2-0 winners last night at Fratton Park. Curtis set up Oli Hawkins for the opening goal in the first half, before the Republic of Ireland international doubled the lead with a close-range finish shortly after the restart. Since making the move from Derry City during the summer, Curtis has made an impressive start to life in England. The 22-year-old has scored seven times already this season, as well as chipping in with eight assists. Despite being in fine form for his new club while operating on the left side of their attack, last night’s goal was his first since he scored the winner against Coventry City last month. “It’s great to be back on the scoresheet and it’s been a long time coming,” he said. “Hopefully now the confidence is back up and I can get a few more from the team. We’ve all got a good relationship and we’re all getting goals. It’s taken a bit of time, but everyone is gelling. Having been a key player for Ireland at U21 level, Curtis made the step-up to the senior side recently. He debuted as a half-time substitute against Northern Ireland and was introduced from the bench again in last week’s clash with Denmark. After making his international breakthrough under Martin O’Neill, the Donegal native is now keen to impress new Ireland manager Mick McCarthy ahead of the start of the Euro 2020 qualification campaign in March. Email “'Hopefully the new manager will see my potential' - Curtis continues fine form”. Feedback on “'Hopefully the new manager will see my potential' - Curtis continues fine form”.